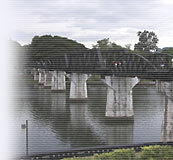 TheRiverKwai.Com - Attractions in River Kwai. The Bridge over the River Kwai is without doubt one of the major attractions for visiting Kanchanaburi and the surrounding regions, although while visit there are many other attractions well worth a visit. Please see those featured below and to the right for some inspiration. Please complete the below form and click on search to find venues to suit your requirements.